Last time we met, I invited you to guess which type of flowers I chose for my wedding bouquet. I bet that if I’d asked for ‘answers on an (e)postcard’, lots of you would have suggested something traditional, like red roses. And you wouldn’t have entirely misjudged me because my first impulse was indeed to carry deep crimson roses, just like the ones my Mum carried when she married my Dad. But once my addiction to wedding magazines took hold, I found myself in something of a quandary as I discovered page after page of eye-poppingly beautiful alternative floral arrangements. 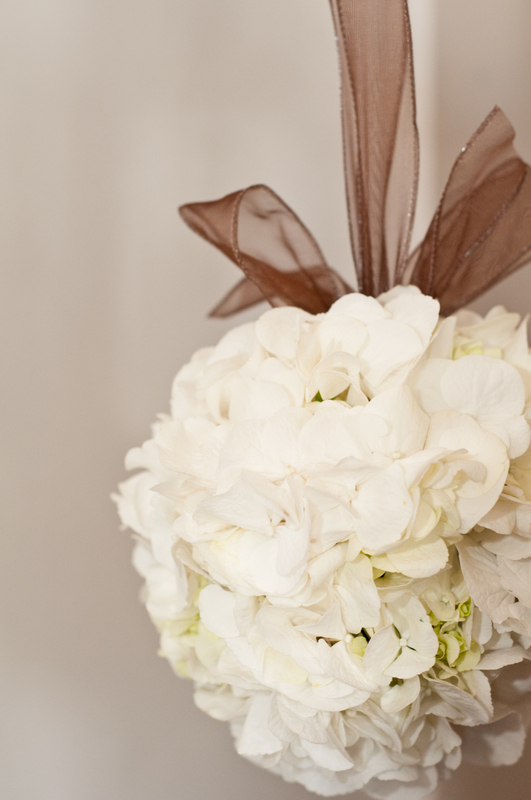 Yet one stood out, head and shoulders, above the rest: a bouquet of hand tied ivory hydrangeas created by North London designer Lubi Lu. Until this point, hydrangeas were flowers which I associated with those faded pink and mauve dried-out bloom heads which I’d seen as a child gathering dust in the homes of distant aged relatives. 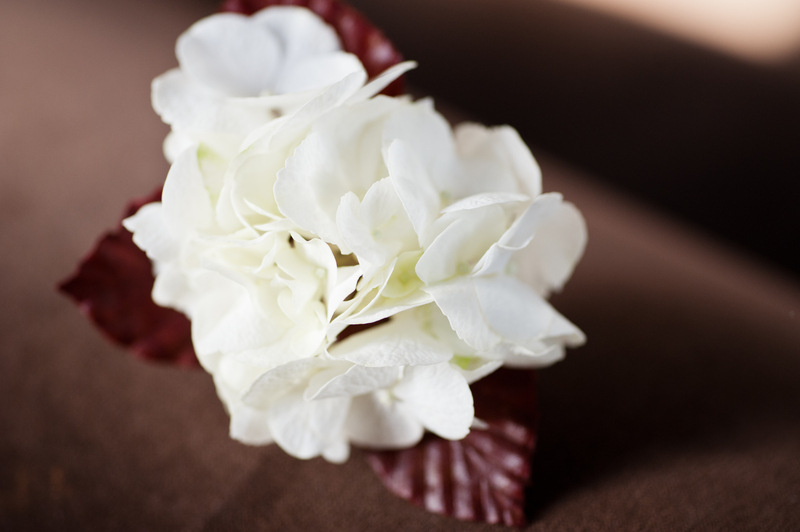 So Lubi Lu’s hydrangea bouquet was a complete revelation: initially drawn to the delightful fresh frothiness of the hydrangea heads, which reminded me of some sort of confectionary involving white chocolate and clotted cream, I soon became almost mesmerised with the delicate flowers, each one comprising three or four simply shaped petals. I loved their simplicity, their elegance and their purity. And, if I had any doubt at all that hydrangeas were the right flowers for an autumn wedding, they were completely blown away when I saw the front cover of the October 2011 edition of Plurality, the All Saints monthly church magazine. It was, as you can see, a photograph of a hydrangea head. Fig.1. 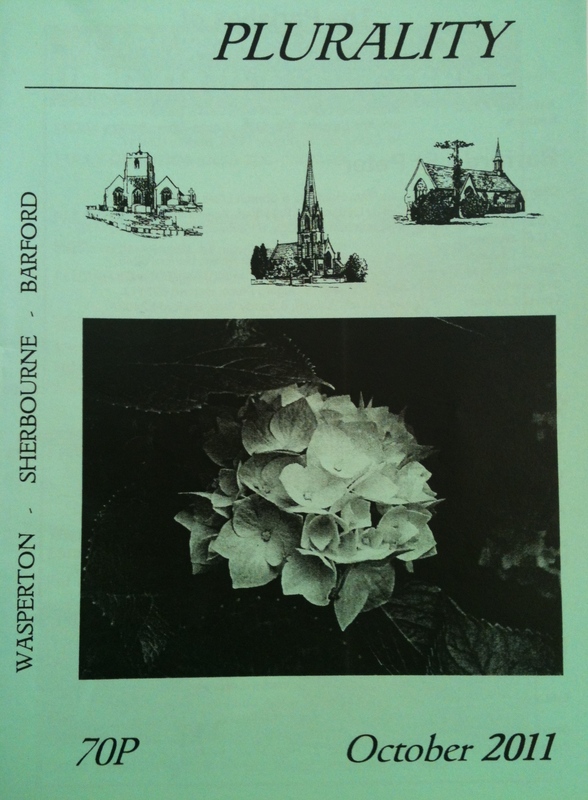 All Saints church magazine. 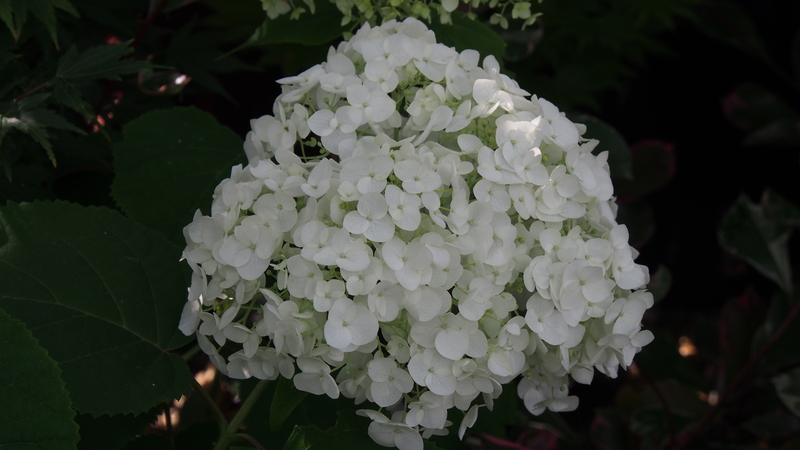 Suddenly I was obsessed with hydrangeas and found myself devoting huge swathes of time into researching the relative mertis of Mophead and Lacecap hydrangeas, which fall into the species of Hydrangea Macrophylla, vis-à-vis Hydrangea Anabelle, a member of the Hydrangea Arborescens family. It was all very confusing and I soon realised that what I needed was an expert in hydrangea cultivation. Luckily, I knew just where to find one: the ‘Yellow Book’. This slim annual volume lists privately owned gardens in England and Wales which are open to the public throughout the year and includes details of those with notable horticultural collections and expertise. At this point I must give huge credit to Mr Moore for driving me, with the cheerfulness and enthusiasm he always displays when embarking on one of my missions, to far-flung gardens so that I could quiz specialists as to the species of hydrangea best suited to a wedding in early October. Fig.2 The big, bold petals of Hydrangea Macrophylla ‘Shakira’. Fig.3. 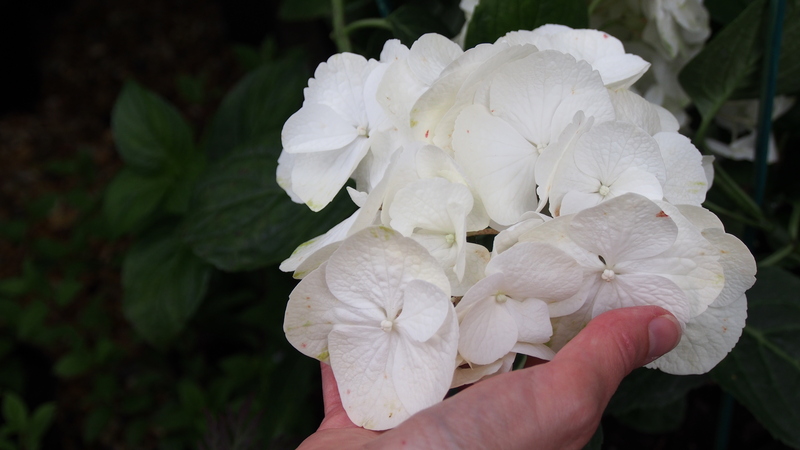 The much more delicate petals of Hydrangea Arborescens ‘Incrediball’. Fig4. Hydrangea Macrophylla ‘Zebra’ with petals that look as if they have been cut with pinking shears. Their advice was, I must confess, not terribly promising: apparently some hydrangeas change colour throughout the flowering season rendering it difficult to predict the exact colour on a given day, whilst others are prone to wilt very quickly. Much better, and less stressful, to change tack and find an alternative flower. But my heart was set on hydrangeas and I refused to be deterred from realising my dream. And, as fortune would have it, my very talented florist, Ailsa of Ailsa’s Floral Design, expressed no qualms whatsoever in working with hydrangeas (or, indeed, the rather exacting Mrs Moore-to-be). 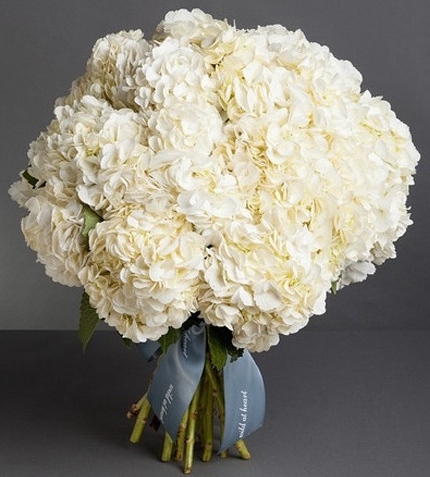 Whatever the shortcomings of hydrangeas, Ailsa overcame them all and created the most glorious bridal bouquet of ivory hydrangeas for me to carry, together with a pomander for MoH, button holes for the gentlemen and a corsage for Mrs Moore Senior. Fig.5. 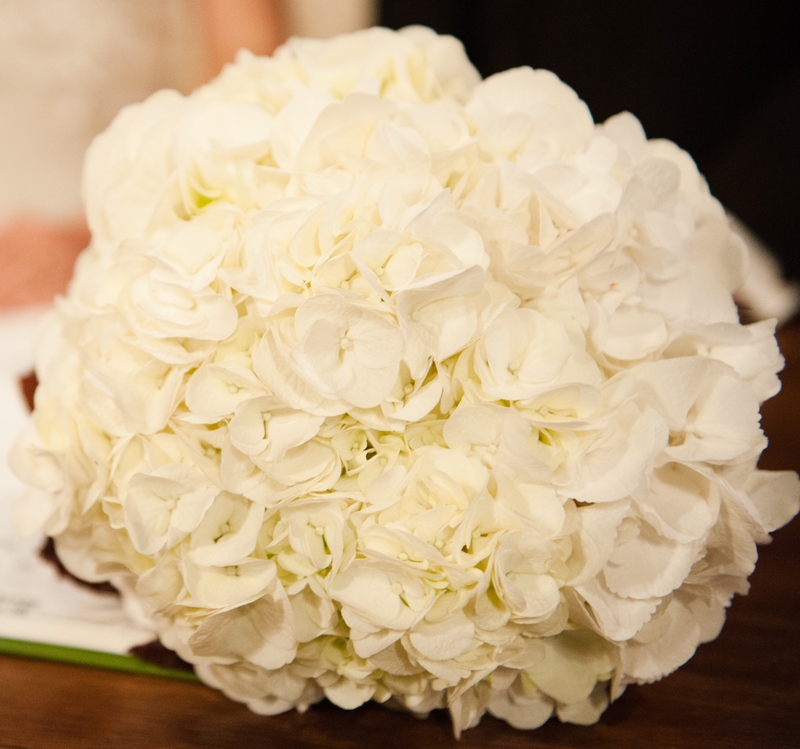 My gorgeous hydrangea wedding bouquet. 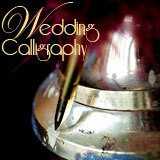 Copyright Tony Rabin Photography. 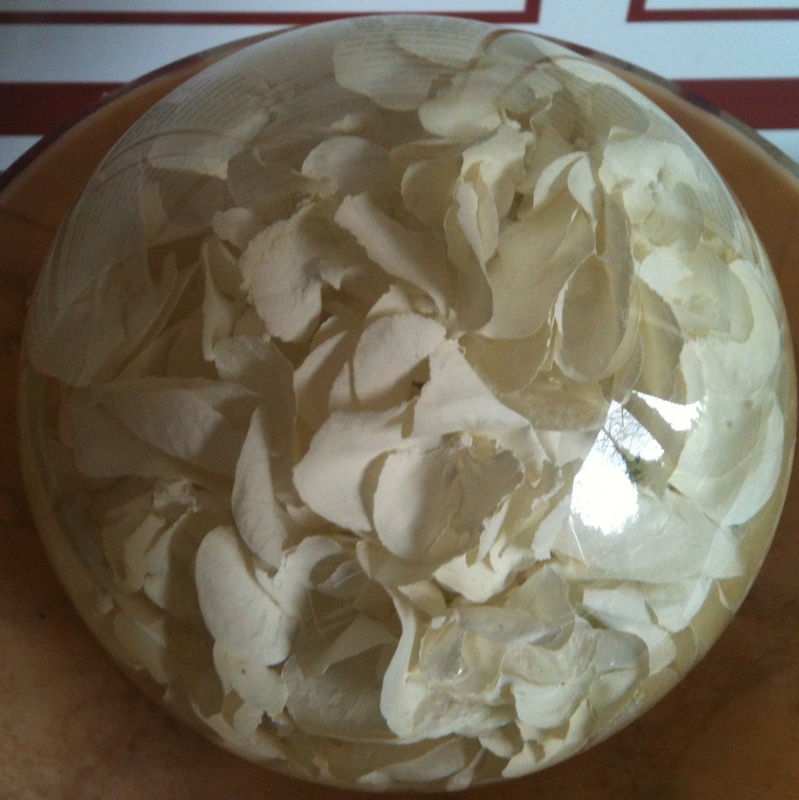 Fig.6 MoH’s equally gorgeous hydrangea pomander. Copyright Tony Rabin Photography. Fig.7. 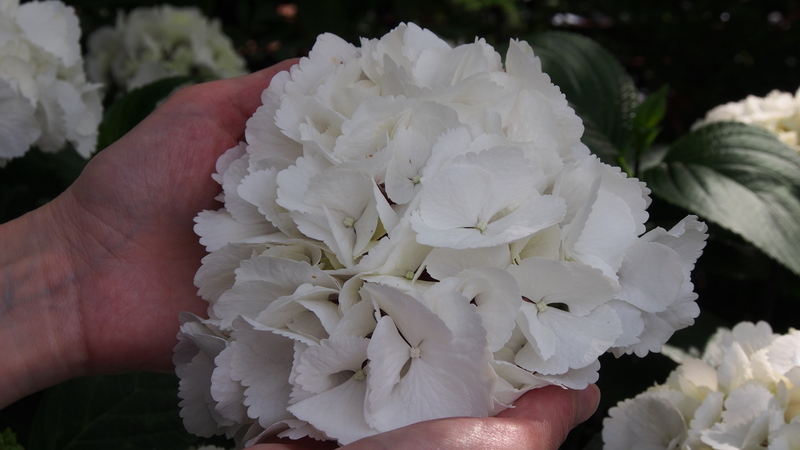 Mr Moore’s Hydrangea button-hole. Tony Rabin Photography. Of equal beauty were the table arrangements Ailsa crafted for our wedding breakfast: glorious great globes of hydrangea heads immersed within goldfish-bowls and illuminated with tiny LED lights. The visual effect was stunning in its simplicity. Fig.8. 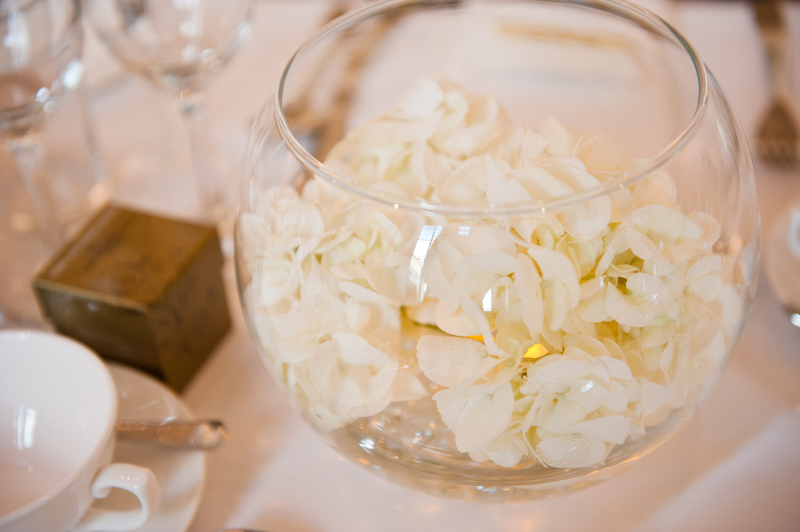 Our hydrangea table decoration. Copyright Tony Rabin Photography. My love affair with hydrangeas extended well beyond fresh flowers into the realm of dried petals so I was delighted to discover not one, but two types of hydrangea confetti: small, ivory freeze dried petals from The Real Petal Company and larger, buttermilk coloured ones from Shropshire Petals. Fig.9. 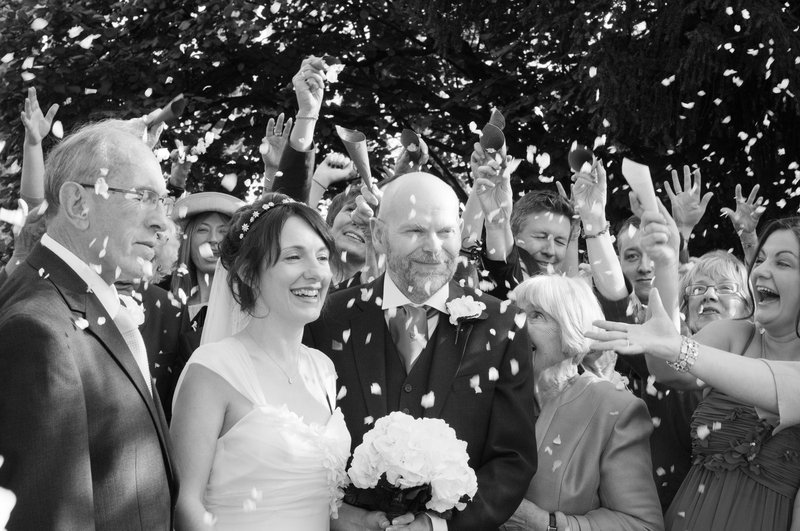 The newly married Mr & Mrs Moore being showered with hydrangea petal confetti. Copyright Tony Rabin Photography. I didn’t just use this lovely frothy mix of combined dried hydrangea petals to fill our confetti cones, I also scattered it around the base of Frostfire’s amazingly realistic flameless wax candles which we used to decorate the wedding breakfast tables. 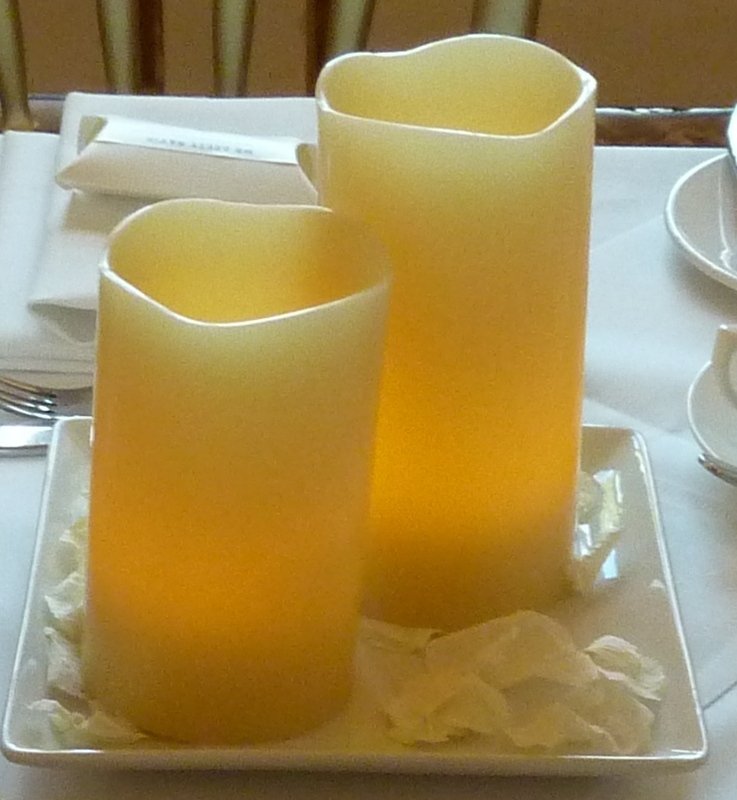 Fig.10.A pair of Frostfire flameless wax candles and hydrangea petal table decorations. I did wonder whether to have a fresh flower topper for our wedding cake but, inspired by the design of my wedding dress, I asked Ben the Cake Man to decorate our cake with royal icing hydrangea petals arranged so that they cascaded down each of the cake’s three circular tiers, increasing in density so that, just like on Fleur’s train, they ‘pooled’ around the base of the cake. Fig.11. 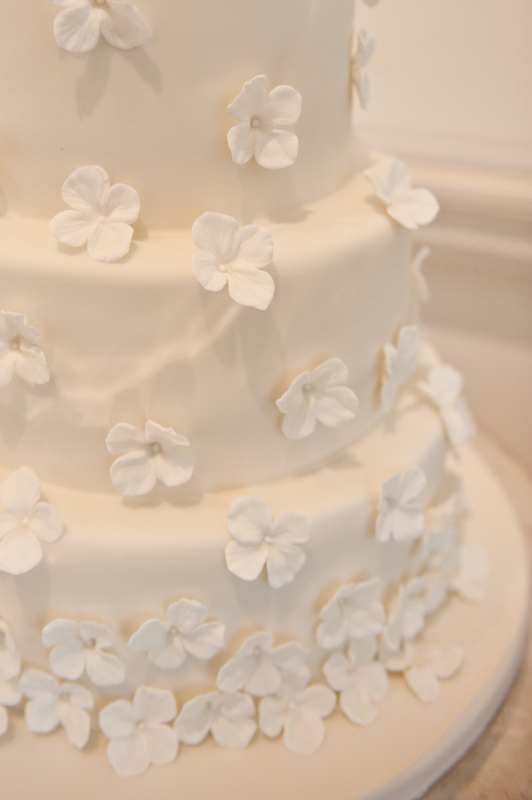 Royal icing ydrangea flowers created by Ben the Cake Man and arranged as a cascade on our wedding cake. Copyright Tony Rabin Photography. Fleur’s petal cascade also inspired the design of my ivory pashmina which was hand painted by designer Candice Wren with stylised flowers and petals. It was all just so blooming lovely! Fig.13. 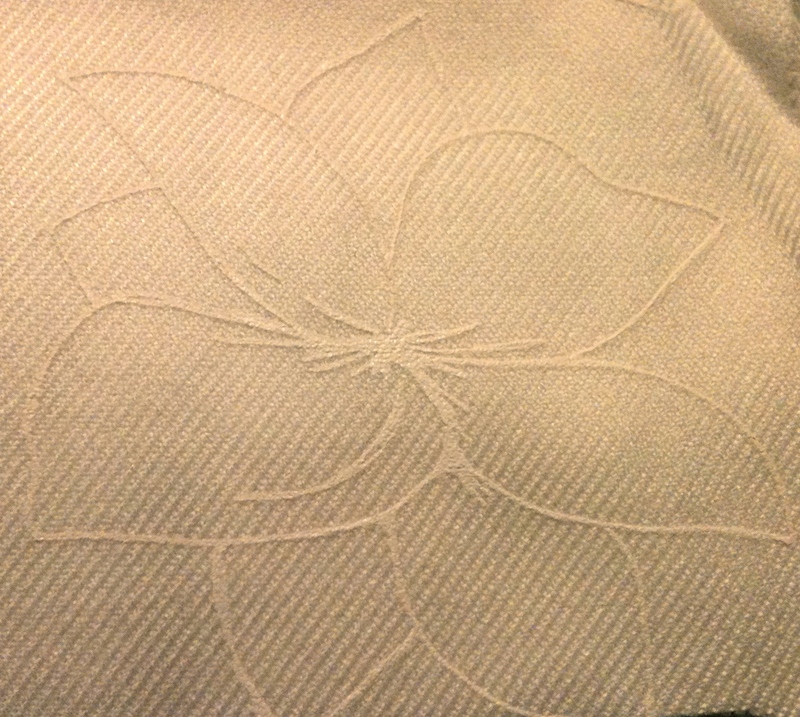 Close-up of my ivory coloured pashmina which Candice Wren hand painted with the outline of a cascade of flowers. My love affair with ivory hydrangeas has continued well into the post-wedding era and will, without any shadow of a doubt, be lifelong. Thanks to The Flower Preservation Workshop, my hydrangea bridal bouquet has been preserved for posterity by being made into the most beautiful paperweight; our living room is graced by a spray of silk hydrangeas from Peony; and on February 14th for the past two years a gorgeous bouquet of hydrangeas has been delivered from Wild at Heart. Fig.14. Paperweight made by The Flower Preservation Workshop using the very flowers from my bridal bouquet. Fig.15. Gorgeous bouquet from Wild at Heart. 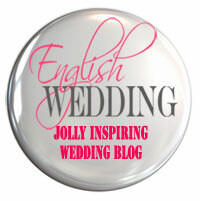 So, in explaining how we themed A Warwickshire Wedding I’ve told you about two key elements: our P&J monogram and the floral motif. There is, however, one piece missing: the colour scheme. But that, my friends, is a story for next time.